This entry was posted in Deutsch, FC Videos by Erik Kunert. Bookmark the permalink. 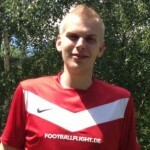 Passionated FC United supporter from Wittenberg, near Berlin and co-founder of this blog. He travels several times a season over to Manchester to watch FC and has already written an article in the official FC United match day programme (Why I love FC United) Furthermore he organises individual football trips to Great Britain for all interested people in Europe on Football Flight.